Alexandra is the latest film from Russian director Aleksandr Sokurov, who cracked cinema wide open with his 90-minute long, single-take trip through Russian history called Russian Ark. His latest film, Alexandra, is a much more conventional drama. If you haven’t read about it, you may find the first 20 minutes of Alexandra or so to be an enjoyable, engrossing mystery. Why would an older, grandmotherly figure in civilian clothes be on a military transport among young soldiers? And why do they defer to her? Is she some grand dame of cinema, or are they just being polite young men, showing proper respect to their elders? The truth is more mundane, but Sokurov does well to portion out the exposition over the course of 30 or 40 minutes. I’ll spoil it for you all at once in this paragraph (spoiler alert) by saying that Alexandra is visiting her grandson, who is stationed at a Russian outpost in an occupied territory. 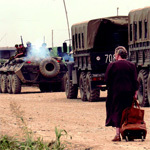 (It’s Chechnya, which I only know from reading about the movie afterwards — the movie itself leaves the details unspoken, making the situation more universal: it could be any occupying army.) Eventually, Alexandra walks off the base and into town where she makes friends with another older woman who keeps shop in town. She’s the only local willing to speak to Alexandra, once they hear her Russian accent. The scenario is cleverly crafted. Drop a no-nonsense, grandmotherly figure into an army base populated with young men and look at the contrasts. Alexandra embraces her role as matriarch and elder, and the young men react accordingly. They are on their best behavior in her presence. Nevertheless, the young men are part of a political and military machine that has rejected the more peaceful worldview of Alexandra’s generation; collectively they hold the power even though individually they feel they must defer to her. Now set the army base in an occupied territory where the locals are none too happy with the occupiers and look at those contrasts. The soldiers fear the locals, and the locals distrust the soldiers. Only the two older women are able cross the boundary and make friends. Everyone else is blinded by the political and military machinery that teaches members of clan A to hate members of clan B. How is it, the film asks, that the elders in a society can be so respected and revered (and also wise and correct), and yet the larger societies ignore their example and rush headlong into the young male pursuits such as war? Sokurov doesn’t have a good answer, but he poses the questions eloquently, with a lot of help from opera star Galina Vishnevskaya as Alexandra. Alexandra is deceptively simple and slow. Watch it for the plot and you’ll be disappointed by how little is happening on screen. But absorb the movie and digest it. Have a conversation with someone about it and you’ll appreciate just how much is actually going on in this seemingly humble little Russian film.